هدف این تحقیق بررسی انگاره‌های مصرف سوخت و عوامل مؤثر بر آن در خانوارهای روستایی بخش مرکزی شهرستان زاهدان بود. جامعة آماری این پژوهش توصیفی خانوارهای روستاهای با جمعیت بیش از 25 خانوار و نمونة آماری آن شامل 250 خانوار بوده است. روایی ابزار جمع‌آوری اطلاعات در این مطالعه که پرسش‌نامه‌ای ساختارند بود، به‌وسیلة پانل متخصصان و پایایی آن با استفاده از یک مطالعة راهنما تأیید شد. نتایج این پژوهش نشان‌داد که تنها 43 درصد (102 خانوار) از خانوارهای روستایی در بهره‌گیری از سوخت، رفتاری بهینه داشته‌اند. بر این مبنا، خانوارهای بهینه‌گرا در مصرف سوخت به لحاظ میانگین سطح سواد، سن، میزان درآمد و ویژگی‌های محل سکونت به‌طور معنی‌داری با خانوارهای ناآگاه در مصرف سوخت تفاوت داشته‌اند. برای شناسایی تعیین‌کننده‌های رفتار مصرف سوخت در بین خانوارهای روستایی از الگوی رفتار منطقی بهره گرفته شد. نتایج حاصل از آزمون معادله‌های ساختاری که برای تعیین کفایت این الگو به‌کار گرفته‌شده بود، نشان داد که متغیرهای گرایش به سوخت مصرفی، نگرش و هنجارهای ذهنی 24/0 درصد از پراکنش رفتار به‌کارگیری سوخت مصرفی خانوارها را پیش‌بینی می‌کند. در پایان توصیه‌های کاربردی برای بهینه‌سازی مصرف سوخت در بین خانوارهای روستایی با تأکید بر حفظ سلامت محیط‌زیست، بهداشت محیط درون خانه ارائه‌شده است. Domestic fuel forms a significant part of the total energy demand and providing adequate and sustainable fuel is considered as a pivotal foundation for development. This survey study aims at investigating domestic fuel consumption patterns of rural areas in central district of Zahedan County, Eastern Iran. The sample was consisted of 250 household heads resided in rural areas with more than 25 households. The validity of questionnaire was confirmed by a panel of experts and its reliability was measured by using a pilot study. Findings revealed that, only 43 percent (n=102 household) revealed an efficient energy use behavior. The efficient energy consumers were significantly different with respect to their education level, age, income, and the other household characteristics. Results from the structural equation modeling which was used to confirm adequacy of the reasoned action model of fuel consumption behavior, showed that 0.24 percent of fuel consumption behavior was determined by attitude, intention and subjective norms towards fuel consumption. The paper presented applied suggestions regarding fuel consumption with special consideration on health and ecosystem and indoor sanitation issues. ترکمانی ج. و دهقان‎پور ح (1388) بررسی رفتار مصرفی خانوارهای شهری و روستایی ایران. علوم و فنون کشاورزی. 48: 391- 402. شادی‌طلب ژ. و نایه‌در م (1388) واکاوی عوامل مؤثر بر پذیرش آبگرمکن‌های خورشیدی خانگی در نواحی روستایی. توسعه روستایی. 1: 67- 87. کفاشیان م (1389) کاربرد نظریه‌های پذیرش فناوری در ارزیابی فناوری اطلاعاتی کتابخانه‌ها. 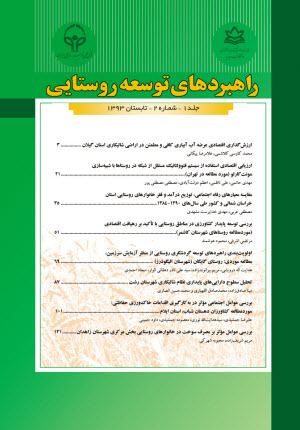 کتابداری و اطلاع‌رسانی. 4: 67- 87. Bhagavan M. and Giriappa S (1995) Biomass energy and economic and natural resource differntion in rural southern india. Biomass and Bioenergy. 3: 181-190. Chen L., Heerink N. and Berg M (2006) Energy consumption in rural china: a household model for three villages in jianxi province. Ecological Economics. 58: 407-420. Ekholm T., Krey V., Pachauri S. and Riahi K (2010) Determinants of household energy consumption in India. Energy Policy. 38: 5696-5707. Gupta G. and Kohlin G (2006) Preferences for domestic fuel: analysis with socio-economic factors and ranking in kolkata, india. Ecological Economics. 57: 107- 121. Hamilton K. and White K (2008) Extending the theory of planned behavior: the role of self and social influences in predicting adolescent regular moderate-to-vigorous physical activity. Sport and Exercise Psychology. 30: 56-74. Howells M (2005) A model of household energy services in a low-income rural african village. Energy Policy. 33: 1833-1851. Hu L. and Bentler P (1999) Cutoff criteria for fit indexes in covariance structure analysis: conventional criteria versus new alternatives. Structural Equation Modeling. 6: 1-55. Kowsari R. and Zerriffi H (2011) Three dimensional energy profile: A conceptual framework for assessing household energy use. Energy Policy. 390: 7505-7517. Link C., Axinn W. and Ghimire D (2011) Household energy consumption: community context and the fuelwood transition. Social Science Research. 41: 598- 611. Mijitaba M. and Jing F (2013) Fuelwood consumption in Niger: A review. Research Studies in Management. 12: 1-10. Nansaor A., Patanothai A., Rambo A. and Simaraks S (2013) The sustainability of biomass energy acquisition by household in urbanizing communities in northeast thailand. Biomass and Bioenergy. 52: 113-121. Peng W., Hisham Z. and Jiahua P (2010) Household level fuel switching in rurul hubei. Energy for Sustainable Development. 14: 238- 244. Shuwen N., Guozhu L., Libang M. and Zhang Z (2009) Assessment of environmental and economic costs of rural household energy consumption in loess Hilly Region, Gansu, China. Renewable Energy. 34: 1438-1444. Vinod J., Chandra A. and Bhattacharya M (2009) Household energy consumption pattern and socio-cultural dimensions associated with it: A case study of rural Haryana, India. Biomass and Bioenergy. 33: 1509-1512. Wang X., Feng Z., Gao X. and Jiang K (1999) On household energy consumption for rural development: A study on yangzhong county of china. Energy. 24: 439-500. Wuyuan P., Zerriffi H. and Jihua H (2008) household level fuel switching in rural hubei. Available at: htpp:// stanford.edu.html (Last access:18 April 2013). Zhang L., Yang Z., Chen V. and Chen G (2009) Rural energy in China: Pattern and policy. Renewable Energy. 34: 2813- 2823. Zhou N., Mcneil M. and Levine M (2010) Energy for 500 million homes: drivers and outlook for residential energy consumption in china. Lawrence Berkeley National Laboratory. 2: 3- 17.